263 Clarendon is located on the east side of Clarendon, between Marlborough and Commonwealth, with 265 Clarendon to the north and 65 Commonwealth to the south, across Alley 423. 263 Clarendon was built ca. 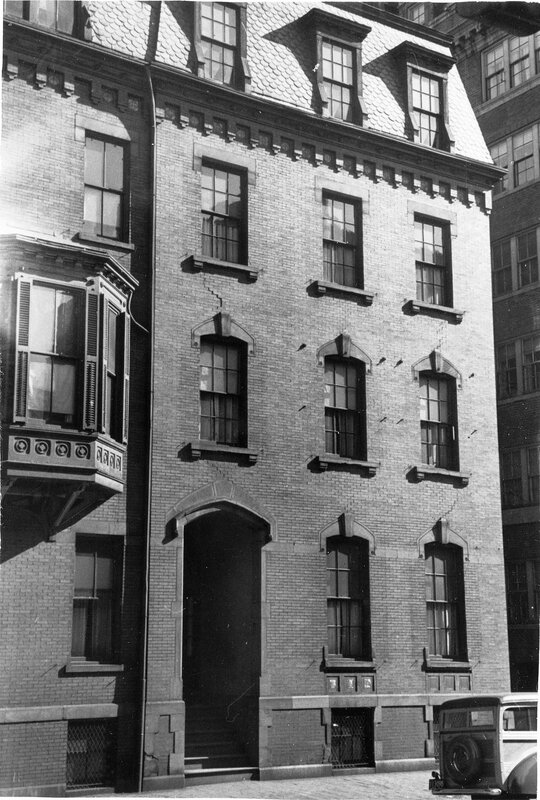 1870 for building contractor George Wheatland, Jr., for speculative sale, one of four contiguous houses (92 Marlborough and 263-265-267 Clarendon) that form a single unit between Marlborough and Public Alley 423. George Wheatland, Jr., purchased the land for the four houses in two transactions. 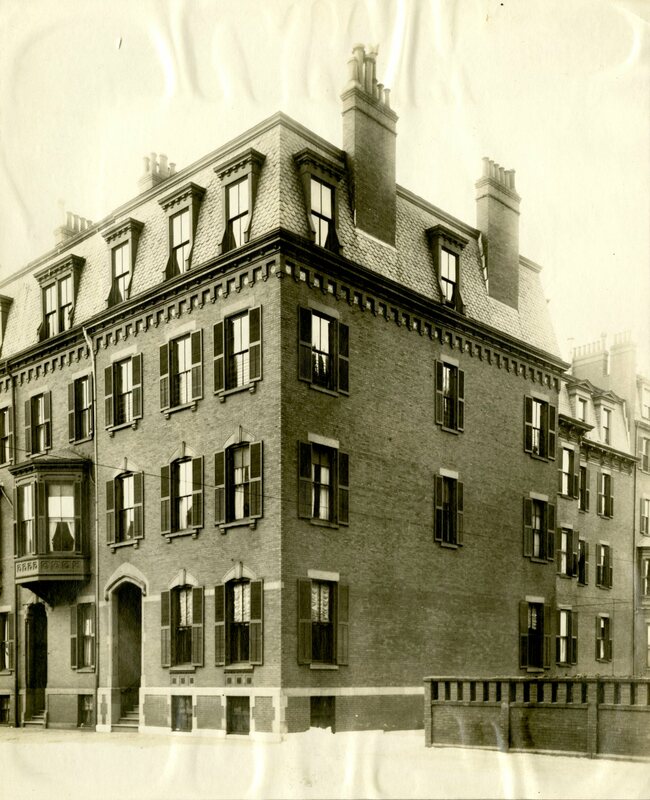 On October 1, 1869, he bought the lot at the corner of Clarendon and Marlborough, with a frontage of 54 feet on Marlborough, from John Revere, and on March 23, 1870, he bought the lot to the east, with a frontage of 12 feet, from architect John H. Sturgis. Both lots had originally been part of a parcel purchased from the Commonwealth of Massachusetts on July 30, 1862, by David Snow. 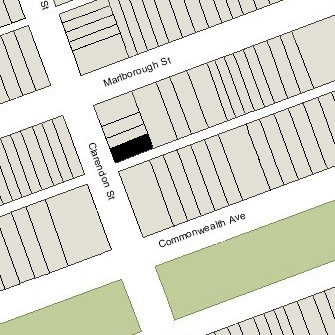 The original deeds for the four houses provided a four foot wide easement at the eastern edge of the lots, running from the southeast corner of 92 Marlborough through the rear yards of 263-265-267 Clarendon, to provide for drainage and access to the alley. Click here for an index to the deeds for 263 Clarendon. On April 23, 1870, 263 Clarendon was purchased by banker and stockbroker Thomas Handasyde Perkins and his wife, Elizabeth Jones (Chadwick) Perkins. The purchase was made by a trust they had established on July 9, 1855, with Elizabeth Perkins as the beneficiary. The Perkinses previously had lived at the Parker House hotel and, before that, at 285 Clarendon. During the 1878-1879 winter season, the Perkinses were living elsewhere and 263 Clarendon was the home of dry goods commission merchant David Nevins, Jr., and his wife, Harriet (Blackburn) Nevins. In 1876, they had lived at 48 Commonwealth. They also maintained a home in South Framingham, which was their primary residence. They had moved from 263 Clarendon by the 1879-1880 season, and it was the Perkinses’ home once again. Elizabeth Perkins died in January of 1888. In about 1889, Thomas Perkins was joined at 263 Clarendon by his son-in-law and daughter, Dr. Francis Sedgwick Watson and Mary (Perkins) Watson. He was a physician. 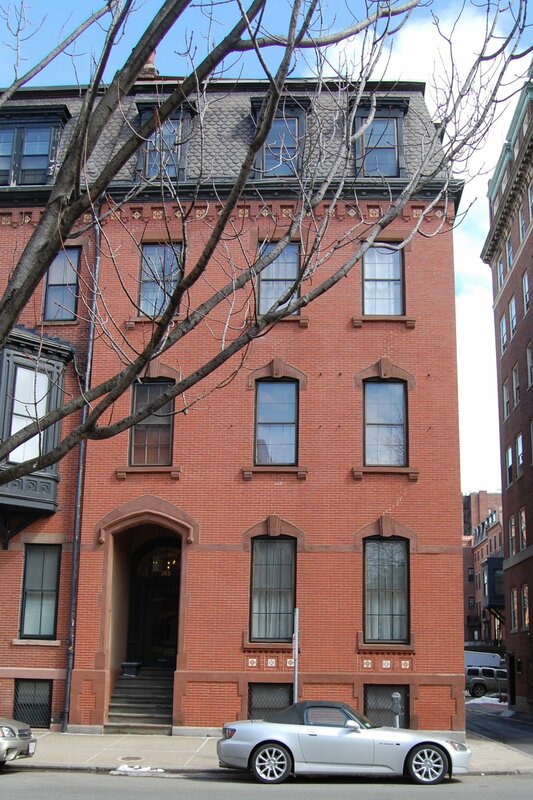 In 1888, the Watsons had lived at 127 Boylston, where he also maintained his medical offices. After moving to 263 Clarendon, he maintained his medical offices at 80 Marlborough (in about 1894) and then, by 1895, at 92 Marlborough. Thomas Perkins died in June of 1900. Francis and Mary Watson continued to live at 263 Clarendon. He continued to maintain his medical offices at 92 Marlborough until about 1917. Mary Watson died in September of 1917 as a result of injuries from falling from a third story window at 263 Clarendon (the Boston Globe article on her death notes that the family had recently returned from the country and “the city house was being opened and Mrs. Watson was assisting the maid and a nurse at the time she lost her balance and fell from the window”). Francis Watson moved soon thereafter. He remarried in 1918 to Genevieve Walker; by the early 1920s, they lived in Sturbridge. 263 Clarendon had continued to be owned by the trust established for Elizabeth Perkins’s benefit and, on November 10, 1917, it sold the house to Marion Steedman (Mason) Wilson, the wife of Richard Thornton Wilson, Jr. She also owned 265 Clarendon, which she had inherited from her father, Amos Lawrence Mason. Richard Wilson was a banker and thoroughbred horse breeder; they lived in New York City and Palmetto Bluff, South Carolina. 263 Clarendon was not listed in the 1919 Blue Book. By the 1919-1920 winter season, 263 Clarendon was the home of architect William Truman Aldrich and his wife, Dorothea (Davenport) Aldrich. They previously had lived at 31 Hereford. They also maintained a home in Marblehead. On May 17, 1921, Dorothea Aldrich purchased 263 Clarendon from Marion Wilson. In July of 1921, William Aldrich applied for (and subsequently received) permission to remodel the house, adding a bay window off the pantry and three windows in a brick wall (probably on the alley). The remodeling was designed by his firm, Bellows and Aldrich. The Aldriches continued to live there in 1928, but had moved to Brookline by 1929. On May 6, 1929, 263 Clarendon was purchased from Dorothea Aldrich by Richard Cutts Storey and his wife, Anna (Ladd) Storey. Anna Storey was the niece of Francis Sedgwick Watson (the daughter of his sister, Anna Russell Watson, and William Jones Ladd). The Storeys also maintained a home in Lincoln. Richard Storey died in June of 1931. Anna Storey continued to live at 263 Clarendon until 1934. Their three younger unmarried sons – Moorfield Storey II, William Ladd Storey, and John Cutts Storey – lived with her. In 1934, 263 Clarendon was leased from Anna Storey by the Katharine Gibbs School. In September of 1934, it applied for (and subsequently received) permission to convert the property into a lodging house (dormitory). It remained a Katharine Gibbs School dormitory until about 1944. On June 29, 1944, 263 Clarendon was purchased from Anna Storey by Alfred Hill Crump and his wife, Alice W. (Northridge) Crump. They lived in Wellesley. By 1945, 263 Clarendon was the home of Joseph Warren Smith Weaver, a sheet metal worker and roofer, and his wife, Helen (Lewis) Weaver, a former nurse, who operated it as a lodging house. In 1944, they had lived and operated a lodging house at 2 Marlborough. The Weavers continued to live at 263 Clarendon in 1946, but had moved by 1947. On November 1, 1945, 263 Clarendon was acquired from the Crumps by Wilbur Harris Payson, a former steamship engineer, who continued to operate it as a lodging house. He previously had been a lodger at 113 Beacon. On March 1, 1972, 263 Clarendon was acquired from Wilbur Payson by Anthony Baker. He continued to operate the property as a lodging house. On August 5, 1976, the Combank Corporation foreclosed on its mortgage to Anthony Baker and sold 263 Clarendon to John J. Hayes, III, and Vernon G. Walen. 263 Clarendon was assessed as a four- to six-family dwelling in 2015.